During U.S. Antibiotic Awareness Week, we remind all Oregonians to use antibiotics as prescribed and to remember that antibiotics are not effective in treating viral infections, such as the common cold or flu. What Is U.S. Antibiotic Awareness Week? U.S Antibiotic Awareness Week is an annual one-week observance held in November to raise awareness of antibiotic resistance and the importance of appropriate antibiotic prescribing and use. It is a key component of CDC’s efforts to improve antibiotic stewardship in communities, in healthcare facilities, and on the farm in collaboration with state-based programs, nonprofit partners, and for-profit partners. 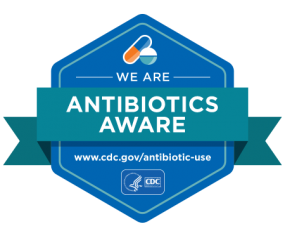 The one-week observance raises awareness of the threat of antibiotic resistance and the importance of appropriate antibiotic prescribing and use. For more ways to get involved with U.S. Antibiotic Awareness Week, contact us at oregon.aware@state.or.us.